Prophet Joseph Igbodo, the General Overseer of Divine Faith Evangelical Mission International, Agbor, in his usual humanitarian service has shown love to the widows at Alisimie in Ika South LGA of Delta state. Prophet Igbodo, who is also the Proprietor of St. Stephen Trust Widows Home and the proprietor of Job Orphanage Home, all in Agbor, in company of his pastors and some members of his church, on Wednesday March 7, 2018, visited the widows at Alisimie. The widows numbering about Ninety seven, from the various quarters in the community, gathered at the church auditorium of Divine Faith Evangelical Mission International, 37, Ebu Street, Alisimie. It was indeed a moment of joy as the women danced in Praises to God, for the safe arrival of the prophet and his entourage to their community. In a brief exhortation, Prophet Igbodo appreciated the widows for coming out in their large numbers to honour his invitation. He admonished them, that as widows, they are the wives of God, and as such they are expected to live a holy life and be steadfast with God, for God is a holy and sincere. He assured the widows that the God who made heavens and earth, that provided the items he brought for them, will continue to provide them with their heart desires. He urged those that have not surrendered their lives to God to do so immediately and repent from their evil ways in order to enjoy the blessings of God. Speaking further, the Prophet of God charged the witches among the widows to desist from it and give their lives to God, emphasizing that nobody destroys others and expects a fulfilled life. He encouraged them to always have the mind to do good and to continually pray for their community, their children, their farmland and their business. Admonishing them he told them that God is a consuming fire and nobody jokes with his name and goes free, noting that most fake preachers of the gospel have gone into extinction because they were not truthful. He urged them to always attend a bible believing church, so that God can protect them and their children. Continuing, Prophet Joseph Igbodo, noted that some of them are responsible for some of their children not coming home to visit them, but rather delights in spending their vacations in their in-laws’ place, because of their (the parents’) evil acts. He told them that, which was the reason he visited them in order for them to amend their evil ways. He asked to know from them, if they know how many years they would stay here on earth, that they will keep using their wicked acts to retard the progress of Alisimie community and their children. He urged those that have ears to change and listen to the admonitions of God, in order to avert the wrath of God upon them. 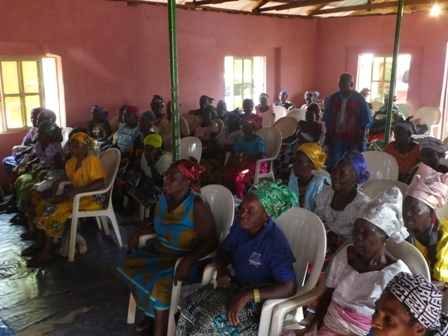 While presenting the food items to the widows, Prophet Igbodo informed them that his one Naira was not in what he brought for them but that they were all provided by God, through spirited individuals and organizations. Items presented to the widows include; Fifteen bags of rice, thirty two cartoons of Indomie Noddles, four cartons of biscuit, eight rolls of cheese balls, twelve bags of clothes, eighteen rows of tissue paper, Twelve cartoons of Bobo fruit juice and two cartons of canoe soap. After the presentation, Prophet Igbodo, assured the women that by God’s grace, the source of the provision will never go dry. He enjoined them to always remember him, the ministry, and the people whom God is using to reach out to them in prayers. Madam R. Odozi, on behalf of the widows, thanked and appreciated Prophet Joseph Igbodo for his benevolence and care. The widows thereafter had a prayer session for the Prophet and his entourage. Prophet Igbodo was accompanied on the visit by Pastor Micheal Ukwuoma, Pastor Austin Ikpegbu, Pastor Osa Imas, Pastor Friday Nzeh, Pastor Patrick Ojogboh, Pastor Chuks Monday, Evang. Justice isreal, Bro. Chuks Ossai, Mrs. Amino, Sister Nkonye Abiwu, with some elders and members of Divine Faith Evangelical Mission International.